A. - Bi-Level design cleans corners easier. Medium fibers. 10". Blue. B. - Medium fibers for all-around cleaning. 8". Blue. 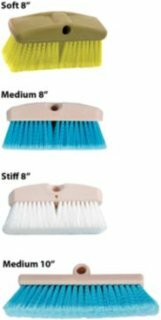 C. - Stiff fibers for heavy dirt and stains. 8". White. D. - Soft fibers. 8''. Yellow.